The objective of this journal is to share current research-based theoretical and practical ideas in the field of Teaching English as a Foreign Language (TEFL). It contains a variety of articles ranging in topics from applied linguistics to pre- and in-service teacher development with particular attention given to the Italian teaching context. Two issues per year are distributed gratuitously to TESOL Italy members. 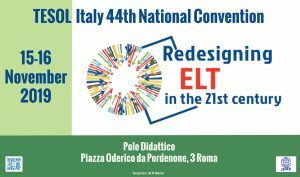 One issue is usually a themed journal while the other issue contains contributions from TESOL Italy’s annual convention. Articles, which contain original research-based insight into the field of language teaching and learning. Reports and Reflections, which provide articles based on qualitative or quantitative classroom investigation. Notepad, which covers a variety of areas including social, cultural, and political issues in language use and education. Curious about the content? Take a look at some past issues’ Table of Contents.